Unfortunately, the most reliable valuation measures we identify (those most strongly correlated with actual subsequent market returns) are about 2.5 to 2.7 times their historical norms here. Paying a valuation premium in this case simply causes prospective future market returns to collapse. While stocks are claims on a very long-term stream of future cash flows, their merits are too often evaluated on the basis of their recent behavior. The fact that investors often respond to low interest rates by driving valuations higher creates the illusion, while it lasts, that rich valuations are not only “justified” but completely inconsequential. Ultimately, prices are expected to go up, because prices are going up, because prices have gone up. A similar issue confronts the argument that stock valuations can be held at permanently elevated levels so long as the Federal Reserve keeps interest rates at depressed levels. The problem here is that if investors believe that future interest rates will remain locked at these lows, it will almost certainly be because growth has failed to accelerate as well. To illustrate this dependency, the chart below shows the relationship between long-term Treasury bond yields and the growth rate of nominal GDP over the preceding decade. Put simply, investors who expect interest rates to be similarly low a decade from today should realize that this expectation embeds a similarly low expectation for economic growth in the interim. Current conditions are at the lower left of this chart. I should note that the Second Liberty Bond Act of 1917 placed a cap on Treasury bond yields of 4 1/4 percent, which was abandoned in March 1971. While quarterly GDP data begin in 1947, there are some points in pre-1947 data where inflation caused acceleration in nominal GDP growth, even though interest rates were constrained. Stock market valuations actually collapsed in those periods. Assumptions about the possibility of low future interest rates should not entice investors to believe that future market valuations will be sustained at presently obscene levels, regardless of whether future interest rates are determined by market forces or artificial constraints. What we have, then, is a market where both interest rates and growth rates are depressed below their historical norms, resulting in a situation where no valuation premium is actually justified, yet where the most reliable valuation measures are about 2.5 to 2.7 times their historical norms, and where even historically normal valuations would likely be associated with below-average subsequent market returns. The unwinding of this delusionary bubble is going to be spectacular. In recent decades, I’ve regularly observed that while corporate earnings are necessary to generate deliverable cash to shareholders, comparing prices to earnings is actually quite a poor way to estimate future investment returns. The reason is simple - most of the variation in earnings, particularly at the index level, is uninformative. Stocks are not a claim to next year’s earnings, but to a very long-term stream of cash flows that will be delivered into the hands of investors over time. Corporate earnings are more variable, historically, than stock prices themselves. Though “operating” earnings are less volatile, all earnings measures are pro-cyclical; expanding during economic expansions, and retreating during recessions. As a result, to quote the legendary value investor Benjamin Graham, “The purchasers view the good current earnings as equivalent to ‘earning power’ and assume that prosperity is equivalent to safety.” For some perspective regarding the recent elevation of profit margins, see This Time is Not Different, Because This Time is Always Different. Not surprisingly, the valuation measures having the strongest correlation with actual subsequent investment returns across history are smoother, and serve as better “sufficient statistics” for the relevant long-term cash flows. For a table comparing the reliability of a variety of alternative valuation measures, see Exhaustion Gaps and the Fear of Missing Out. In order to provide the longest perspective possible, and also to offer a measure that can be easily calculated and validated should one choose to do so, the chart below shows my variant of Robert Shiller’s cyclically-adjusted P/E (CAPE), which can be substantially improved, as measured by its correlation with actual subsequent market returns, by adjusting the multiple for its embedded profit margin. I originally used the ratio of Shiller earnings (the denominator of the Shiller P/E) to S&P 500 revenues as a measure of the embedded margin. 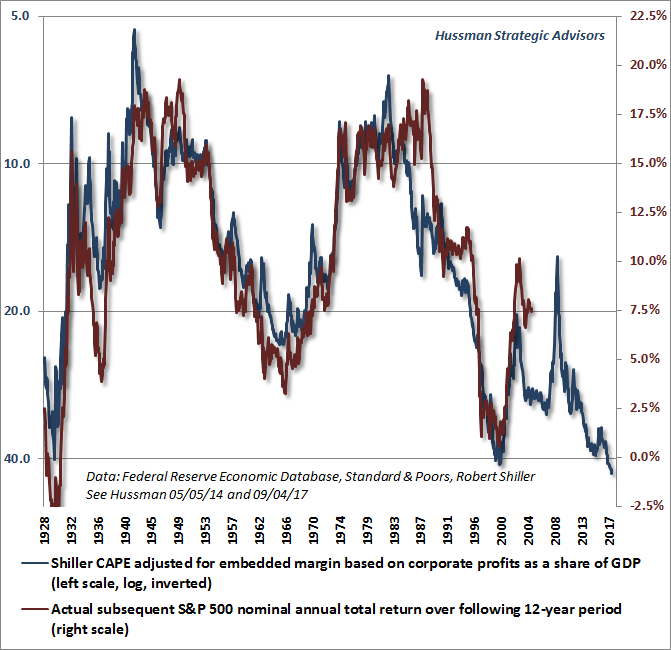 Since freely available data on S&P 500 revenues is limited, the embedded margin is proxied here by the ratio of corporate profits to GDP (allowing the measure to be calculated back to the 1920's h/t Michael Ritger). Specifically, the CAPE (calculated here as the ratio of the S&P 500 to the 10-year smoothing of inflation-adjusted earnings) is multiplied at each point in time by a factor equal to the 10-year smoothing of corporate after-tax profits to GDP, divided by the historical norm of 5.4%. The resulting measure is similar to the S&P 500 price/revenue multiple, the ratio of market capitalization to corporate gross value-added, and other measures that share a correlation near 90% or higher with actual subsequent 10-12 year S&P 500 total returns in market cycles across history. The chart below shows the relationship between the margin-adjusted CAPE above and actual subsequent 12-year S&P 500 total returns (we use a 12-year horizon because that's the point where the autocorrelation profile of valuations typically hits zero). 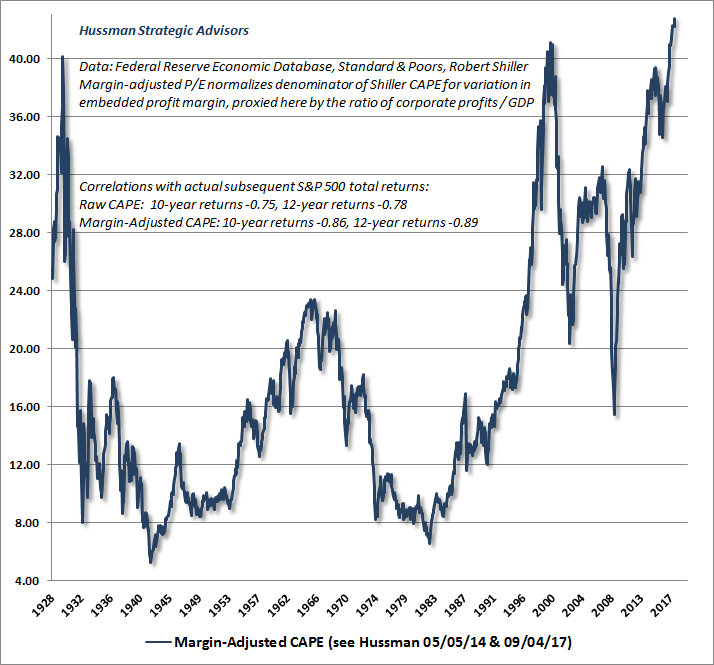 The blue line shows the margin-adjusted CAPE on an inverted log scale, so lower levels on the blue line represent more extreme levels of overvaluation, and higher levels on the blue line show more extreme levels of undervaluation. For arithmetic formalizing the relationship between log valuations and subsequent market returns, see Rarefied Air: Valuations and Subsequent Market Returns). The red line shows actual subsequent 12-year market returns (and of course, ends 12-years ago). Note that the 2000-2002 and 2007-2009 collapses appear as upward spikes in the blue line, corresponding to an improvement in subsequent market return prospects. Investors should fully expect the same type of spike in the next few years. Note that valuation extremes in 1929 and 2000 were followed by low or negative market returns over the following 12-year period, with wicked market losses in the interim. I expect the same outcome from the present extreme, with our most reliable measures projecting a loss in the S&P 500 on the order of about -60% over the completion of the current cycle. 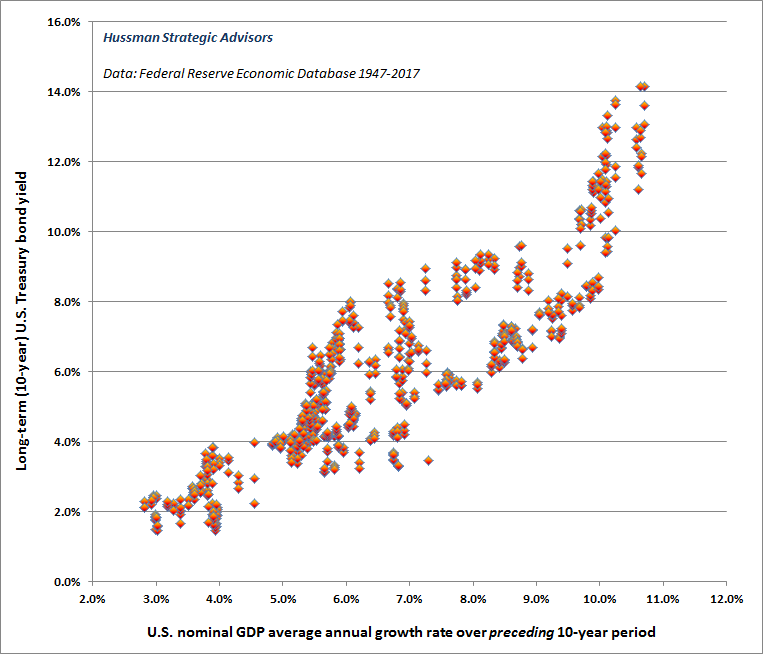 With the central tendency of real U.S. GDP likely to average a sustained growth rate hardly above 1% annually in the coming years, investors seem to underestimate how little will be required to push the U.S. into recession. Nor do they seem fazed by the fact that 75% of all corporate debt issuance is now "covenant lite," that corporate debt as a ratio of non-financial corporate gross value-added has expanded to the highest level in history, that financial assets represent nearly half of the total assets of even non-financial U.S. corporations (where less than 10% of this represents cash and equivalents, and nearly one-third is in stocks), and where those financial assets comprise literally 90% of the total corporate net worth of these companies. The cross-dependencies here are outrageous. Finally, with a record number of ETF closings, paced by alternative and bearish strategies, and with many value-oriented and macro investors abandoning their disciplines, let me offer a sense of why I haven’t laid down like a good boy and rolled over here, and why most of what I have remains confidently invested in our own discipline. We’ve repeatedly demonstrated the merits of a value-conscious, historically-informed, full-cycle discipline in prior complete market cycles. I’ve also regularly detailed the inadvertent stumble in the advancing half-cycle since 2009 that resulted from my insistence on stress-testing our methods against Depression era data after a market collapse that we fully anticipated, and the knock-on effects that followed that stress-testing decision (see Being Wrong in an Interesting Way for that narrative). The strongest market return/risk classifications we identify are associated with a material retreat in valuations that is then joined by an early improvement in market action. I have little doubt we’ll observe similar opportunities to take a constructive or aggressive market outlook, as I have after every bear market in over three decades as a professional investor (including late-2008, after the S&P 500 had dropped by more than -40%, though that shift was later truncated by my 2009 insistence on stress-testing). Conversely, the weakest market return/risk classifications we identify are associated with rich valuations that are then joined by an early deterioration in market action. Quantitative easing introduced an essential wrinkle to that: in the face of zero interest rates, even the most extreme “overvalued, overbought, overbullish” features of market action were not enough to adopt a hard-negative outlook. One had to wait for the uniformity of market internals to deteriorate explicitly, indicating a subtle shift in the preferences of investors away from speculation toward risk aversion (when investors are inclined to speculate, they tend to be indiscriminate about it). That single adaptation could have dramatically changed our experience in this half cycle. Even with interest rates back above zero, I expect we’ll refrain from similarly negative outlooks in the future, even in the face of extreme “overvalued, overbought, overbullish” features, provided that our measures of market internals are uniformly favorable (which is not presently the case). In my view, that single adaptation is enough to allow for the possibility that the financial markets have permanently changed, zero interest rates or not. In that event, I expect that it is the only adaptation our value-conscious discipline would need to effectively navigate future cycles. Extreme valuations coupled with early deterioration in market action allowed us to correctly anticipate the 2000-2002 and 2007-2009 market collapses, and we presently observe the same combination. This includes continued dispersion in our measures of market internals. In the event these measures of market internals were to improve, our long-term outlook would remain unchanged, but our near-term outlook would become more neutral. I believe that investors have sufficient information to distinguish the basis of my successes in prior complete cycles from the basis of my inadvertent stumble in the recent half-cycle. The clearest successes, including encouraging leverage in the early-1990’s, becoming defensive by the 2000 peak, shifting to a constructive outlook in early-2003, becoming defensive by the 2007 peak, and shifting to a constructive outlook after the market collapsed in 2008 - though truncated by my 2009 insistence on stress-testing - were all points where the shifts were consistent with prevailing valuations. My ill-timed 2009 stress-testing decision (and the difficulty that followed) was the exception; motivated by economic outcomes that were wholly outside of post-war experience, and the observation that even though 2009 valuations were reasonable, similar valuations were followed, in the Depression, by a nearly two-thirds loss in the stock market. In my view, the most extreme point of market valuation in U.S. history is neither the time to extrapolate the half-cycle advance from the 2009 market low, nor the time to extrapolate the challenge that we’ve experienced, and have largely addressed, in this half-cycle. As for the notion of being “too early” (which as value-conscious investors, we often are), recall that the 2000-2002 decline wiped out the entire total return of the S&P 500, in excess of Treasury bill returns, all the way back to May 1996. Recall that the 2007-2009 decline wiped out the entire total return of the S&P 500, in excess of Treasury bill returns, all the way back to June 1995. Think about that carefully. By the end of the most recent complete market cycle in March 2009, safe, lowly cash had outperformed the S&P 500 for nearly 14 years, despite two intervening market bubbles. The complete market cycle is enormously forgiving of investors who become defensive “too early” in a strenuously overvalued market. This is a lesson that investors still have an opportunity to act upon, by reducing portfolio sensitivity to general market fluctuations in favor of cash, hedged-equity and other alternatives until a material retreat in valuations is joined by early improvement in market action. I fully expect the completion of the current market cycle to wipe out the entire total return of the S&P 500, in excess of Treasury bill returns, all the way back to 2000, and more likely to roughly October 1997 (and that’s assuming that valuations don’t even breach historical norms). We’ve certainly drawn useful lessons from the recent half-cycle, but whether the market moves higher or lower in the near term, I doubt that value-conscious investors will lament having been “too early” by the time this cycle is completed.